The press in Sinaloa, in northwestern Mexico, no longer conducts investigative journalism following the death of Javier Valdez, a journalist from the Sinaloan weekly newspaper Ríodoce, who was killed on May 15 of this year. When they killed Valdez, they practically murdered freedom of expression in Sinaloa, said a visibly upset Alejandro Sicairos, one of the founders of Ríodoce and a colleague and close friend of Valdez. "They selected the victim well, because Javier was a journalist who had a very important international projection, who for us journalists in Sinaloa was an emblem of the activity, that had to be done with all responsibility, courage and professionalism. (...) It's another blow, let's say the kill shot, for journalism in Mexico," Sicairos, also current director of Asociación de Periodistas y Comunicadores 7 de junio, told the Knight Center. Valdez, founder and reporter of Ríodoce, and correspondent of La Jornada, was killed in cold blood by unknown individuals who blocked him in the street, forced him out of his car and asked him to kneel before shooting him twelve times. The journalist produced investigative journalism on drug trafficking and organized crime in Sinaloa. According to Sicairos, investigations into his death remain stagnant. Four months after the murder of Valdez, state and federal prosecutors have still not found those responsible. With at least 11 journalists killed so far in 2017, generally because of their journalistic work, Mexico is currently experiencing one of the bloodiest waves of violence in recent years. This situation of open aggression against the press in Mexico was discussed at a Sept. 13 emergency forum organized by the Teresa Lozano Long Institute of Latin American Studies, the Knight Center for Journalism in the Americas and the Mexico Center at LLILAS Benson at the University of Texas at Austin. The event, Foro Urgente: Mexican Journalists Confront Violence, brought recognized and award-winning Mexican journalists to Austin. 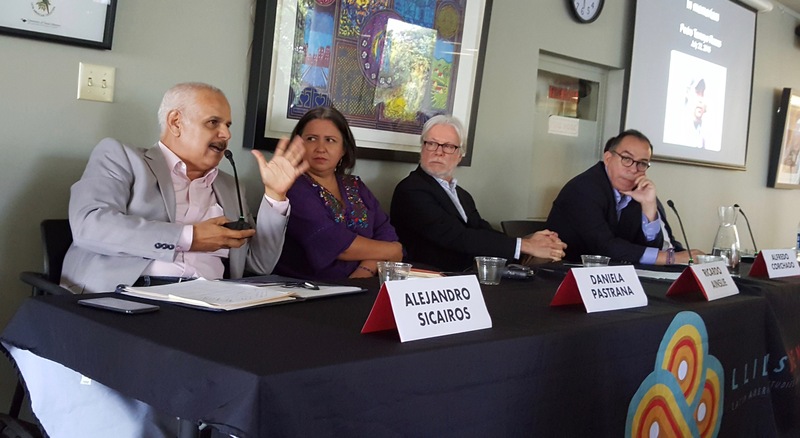 In addition to Sicairos, the panelists included journalists Daniela Pastrana, director of Periodistas de a Pie; Alfredo Corchado, Mexico City correspondent for The Dallas Morning News; and Ramón Cantú, editor of El Mañana in Nuevo Laredo. 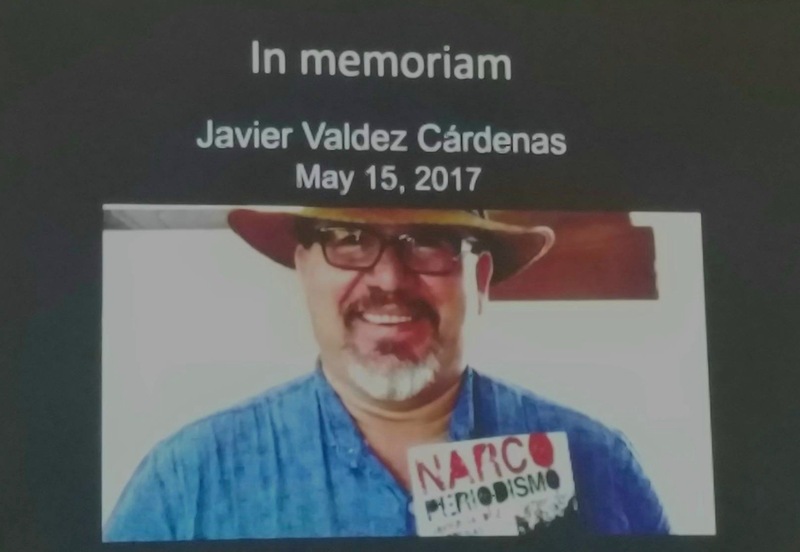 In a brief interview with the Knight Center, Sicairos spoke about the impact of Javier Valdez’s murder on the Mexican press, especially in Sinaloa. "Journalism in Mexico and Sinaloa is badly hit by fear. The case of the attack on Javier Valdez was a sure attack on journalism,” Sicairos said. For the journalist, this situation will continue to deteriorate if the press is not organized with international journalism and human rights organizations and institutions. With help from these groups, actions can be taken to ensure the protection of journalists and the free exercise of the profession in Mexico. "Javier (Valdez), Miroslava (Breach), (Salvador) Adame, many cases, what we want most importantly is justice. (...) What we want is to find, catch and bring the murderers of journalists to court. That would be the only way to re-establish that ability to do brave journalism, investigative journalism, in-depth journalism. In the meantime, it will be very difficult for us to regain that trust in Mexico, to do investigative journalism," Sicairos lamented. The journalist said that both he and a group of Sinaloa journalists are working with the international organizations Committee for the Protection of Journalists (CPJ), Article 19 of Mexico and Reporters Without Borders (RSF) on a protocol for the protection of journalists that is more solid and consistent and that adapts to the reality and necessities of Sinaloa. They are already in talks with Sinaloan authorities so that once finished, it will be implemented in the state. "Well, there (in Sinaloa) we have the main drug trafficking organizations (in Mexico), and very specific measures need to be taken in this place where the situation of violence is uncontrollable. (...) In Sinaloa, silence is being kept, society does not protest, does not come out, we are only 30 or 40 journalists who go out into the street, society has stopped supporting us, because it is afraid, and it has reason," Sicairos said. Likewise, the journalist reported that in Sinaloa, when a politician's brother, a great businessman, or a notable athlete are killed, the state's justice mechanisms are quickly activated and potential suspects are detained in a short time. "They do not do the same with journalists, then, there is an amalgam of indifference, corruption, impunity, narco-politics. There, self-censorship plays a very important role. One for fear, and another for caring for advertising contracts that endanger the survival of the media outlet itself, "he said. Since Valdez’s murder, Sinaloan journalists have self-censored much more. They no longer write what they want to write. They go in groups to cover news about crime, Sicairos said. He added that even when they know who is responsible for this or that confrontation or homicide they are covering, they do not write it because they know that they could lose their life for it. In such situations, some international organizations recommend that you stop reporting in conflict zones and that you do not touch organized crime issues. The fear in Sinaloa is widespread, the journalist explained. "In a state in which they kill on average six people a day, where in six years we had more than 7,500 crimes, in a state where there are already almost four thousand forced disappearances, in a state in whose communities in the sierra violence is displacing people, is forcing them out, in a state in which the army has been present since the beginning of the year and the crime rate has not been reduced. What remains, rather than being afraid? People do not talk about these issues, we are the journalists who are talking about this, but only partly now. We cannot resign ourselves to living like this," he added.